As a newcomer to the United States I was keen to get to know the local flora. Plants common to some of you are exotic and exciting to my eyes, and I thought it would be fun to get to know them better. This new column will introduce a wildflower native to the area - hopefully one in flower at the time of publication. The frosty asters described by Carman in his poem A Vagabond Song almost certainly are Eurybia Divericatus (the White Woodland Aster), a perennial native to the northeast. I love spotting this plantʼs little white stars popping up in hedgerows, and sparkling like fairy dust in the dark green of late summer and early fall along the path in Tallman Park. From my own experience this is a plant I would not be without. It tolerates the challenges of dry shade very well, and provides a late season froth that I adore. It is one of the first plants I purchased when starting my own garden with the hope, now realized, that the seed and rhizomes of a single plant would spread to become large clumps resplendent with tiny white starry flowers. Itʼs a phenomenon I encourage and enjoy. The White Woodland Aster is also deer resistant so if you have a shady path where deer like to roam it is a perfect addition - perhaps in combination with the large leathery leaves of Bergenia cordifolia (commonly known as Elephantʼs Ears or Pigsqueak). This is the partnership Jekyll promoted. 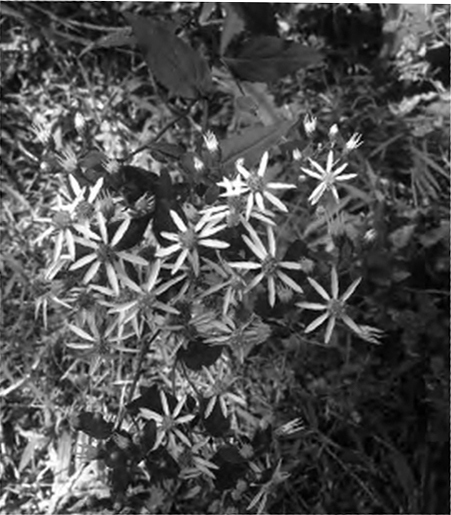 And for those of you who like to learn the Latin names for plants, White Woodland Aster was named Aster Divaricatus until a study in 1994 discovered that the Aster species in Eurasia, and the species considered Aster in America were in fact two different genera. It was decreed that none of the 180 American species referred to as Asters were indeed Asters - that honor went to the Eurasian Asters. In response, the American Asters have been split into a variety of different genera and now go by new Latin names. Some of the original names were published long ago, and by the rules of plant nomenclature, the first name published is the correct one. 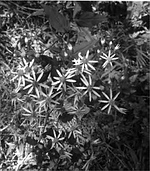 So… because Eurybia is the original earlier name for this plant, it thus reverts from Aster Divaricatus to Eurybia Divaricatus. Indeed, at least two other plants you may think of as Asters are now classified as Symphotrichon and Ampelaster. All very confusing I hear you cry! Less confusing than the mess we get into using the common colloquial names….but thatʼs a story for another column.